The “Mancelona Mansion” looks like it belongs in Hollywood, but instead is tucked into a very nice neighborhood in the heart of northern Michigan. 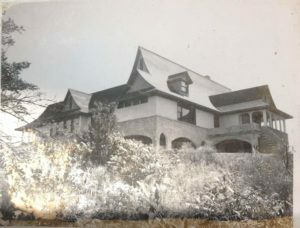 John Carmichael, who built the mansion for his large family in 1969, was also known for building unique homes on Carmichael Lane, which is on Starvation Lake between Kalkaska and Mancelona. The mansion, which is currently listed for sale for $200,000, has unique architectural features, curves and delightful surprises at every turn. It features a large in-law suite within its 3899 square feet, in addition to 770 square feet of unfinished space. 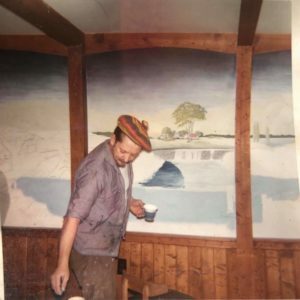 According to his son Tim Carmichael, John was known as being quite eccentric. For example, he was never seen without his plaid Scottish tam. The unfinished space in the home would add 770+ square feet of a large Master Suite complete with private bathroom, walk-in closets. wood burning stove, and custom curved windows. This space has been worked on by various owners over the years. 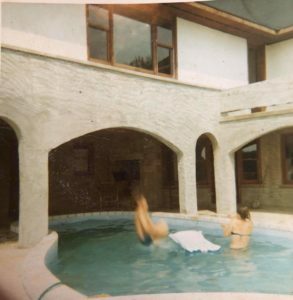 Tim believes that the German buyer who bought the home from John Carmichael, collected trains which were set up in the unfinished part of the home. In addition to John Carmichael’s son, others in town expressed memories of the home when it was posted on Facebook. 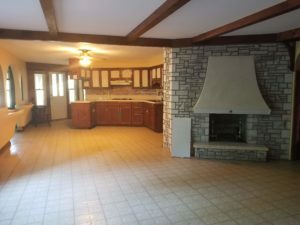 The main floor of the home features a large living room with a fireplace and dining room/kitchen area. 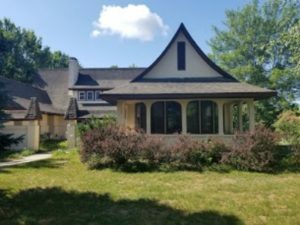 There is also a main floor Master bedroom with a large walk-in closet and jetted tub, as well as a 4th partially finished bedroom on the main floor. Walk up a winding stairway to two additional large bedrooms and full bath! Wind downstairs to an entire second living area which includes large family room with fireplace, second 13′ x 14; kitchen, 13′ x 14′ dining room, 3rd bathroom, lots of storage, and laundry. An outside wood burner can heat the hot water for the furnace. The gardens have a variety of paths, perennials and more which need some TLC. There is a park across the street which includes a labyrinth. This unbelievable property is located in the family friendly town of Mancelona walking distance to stores, and excellent schools. It is also near Shanty Creek Ski and Golf Resort, with excellent snowmobiling trails, hunting, and lakes and rivers near by. Click here for more information, or contact DEK Realty at 231-587-1012 or dokrieg@gmail.com.